Northern Tablelands MP Adam Marshall, left, Inverell RSM Gun Club President John Kent, member Mat Colley, Secretary Jason Carpenter and Inverell Shire Deputy Mayor Anthony Michael at the club over the weekend. 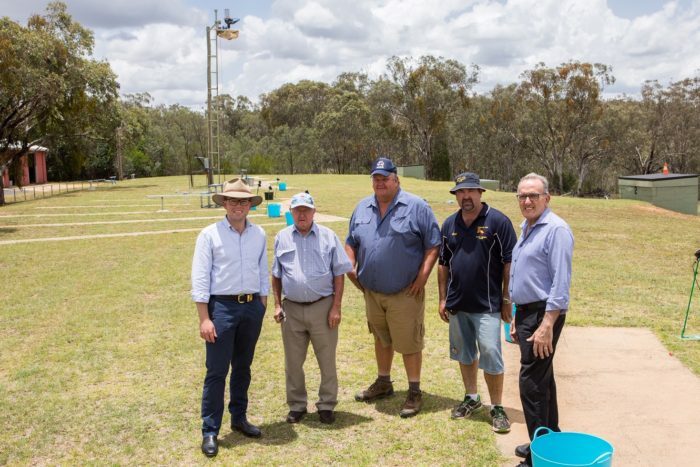 NORTHERN Tablelands MP Adam Marshall has announced an $18,000 State Government funding hit for the Inverell RSM Clay Target Club to construct new safety fencing that will increase security and protection for club members and the public. Mr Marshall said the grant would allow the club to erect new perimeter fencing on three sides of the range, on the Glen Innes Road, just outside Inverell. “It’s a project that will increase safety for the general public but also upgrade security and safety for the members’ clubhouse and range facilities,” Mr Marshall said. “The club is a shotgun, clay target, club that’s been going for some 53 years so it’s got a long history of providing recreational shooting for locals. Club Secretary Jason Carpenter said the funding would allow them to significantly upgrade perimeter fencing, including clearing some of the front entrance roadside shrubbery to allow for a Colorbond fence about 1.8 metres high to be laid along a 100 metre line on the Glen Innes Road. “And we will be able to put up steel and wire rural-type fencing about 600 metres along two other sides; the remaining side backs onto a national park area,” Mr Carpenter said. Mr Marshall said the club had about 40 members who shot every third Saturday of the month, but also plays hosts to other gun enthusiasts, including local Sporting Shooters members and visiting clubs.